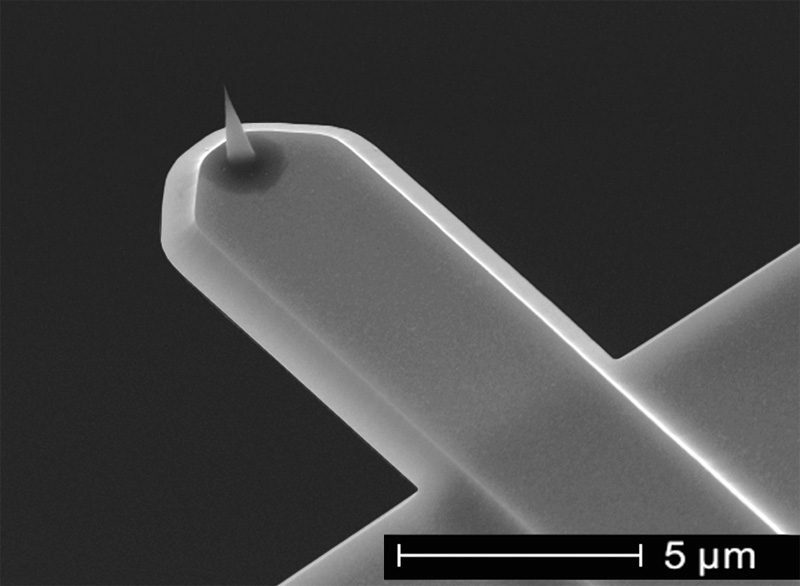 Neuchâtel, February 19th 2014, NanoWorld AG today announced the official commercialization of six types of Ultra-Short Cantilevers (USC) dedicated for use in High-Speed Atomic Force Microscopy (HS-AFM). High Speed Atomic Force Microscopy is a quickly evolving technique within the field of Scanning Probe Microscopy that enables the users of dedicated instruments and AFM probes to visualize dynamic processes at the single molecule level. (See also www.highspeedscanning.com). After a very successful beta-testing phase six types of AFM probes for high speed scanning will be commercially available from now on. Product Screencast on the NanoWorld Ultra-Short Cantilevers (USC) given by Mathieu Burri, Head of Product Development. Ultra-Short Cantilevers (USC) combine very small cantilevers capable of resonating at frequencies up to 5 MHz and a very sharp and wear resistant High Density Carbon / Diamond Like Carbon (HDC / DLC) tip.